Chuck and I were treated to a wonderful salmon dinner recently made by our friend, Nata. Our main attraction, the crusted salmon, was delicious but the roasted squash side dish ended up stealing the show. I happily cleaned my plate because not only was it hearty, but it was also incredibly healthy. You can help yourself to seconds, guilt-free. This would be a great dish to bring to a Thanksgiving dinner. 2. Cover the bottom of a large baking sheet with aluminum foil. 3. 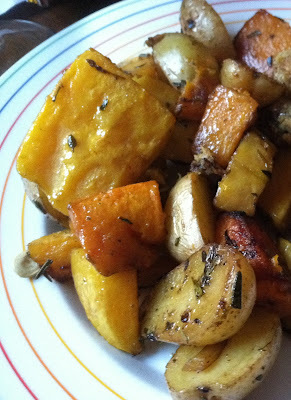 Place the potatoes and squash on the baking sheet and toss with olive oil, rosemary, thyme, oregano, garlic, balsamic, and salt and pepper to coat well. 4. Roast the vegetables until tender, turning every 15 minutes for approximately 45-55 minutes. 5. The veggies should be tender on the inside and caramelized in on the outside. Adjust seasoning to taste and serve immediately. Hi Megan! It's Emily- Nicole's friend from high school. I know it's been a while since we met, but Nicole introduced me to your site. These veggies look delicious and perfectly caramelized. Looking back through your older posts, it sure seems like you two have a lot of fun foodie adventures! I've always thought about starting a food blog, but haven't been able to commit (yet), so awesome work on getting your own up and running. I look forward to reading more! Emily so good to hear from you! Glad you are enjoying our posts - you should totally start a cheese blog. I've been trying to make mozzarella and can't quite it right...need tips from the expert!